Please, let’s all band together and do the right thing. Most of us would be considered guests as we enjoy the OBX beaches; let’s abide by the law and treat our hosts with the respect they deserve. Irresponsibility and a total disregard for the law can easily lead to further/additional restrictions (or complete banishment). The information below can be used as initial, up to the minute points-of-contact for further information. 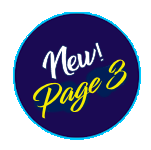 It is important to remember that applicable laws/regulations can be dictated at a City, County, State Park, or National Park level; depending on the location and possibly by the time of year. 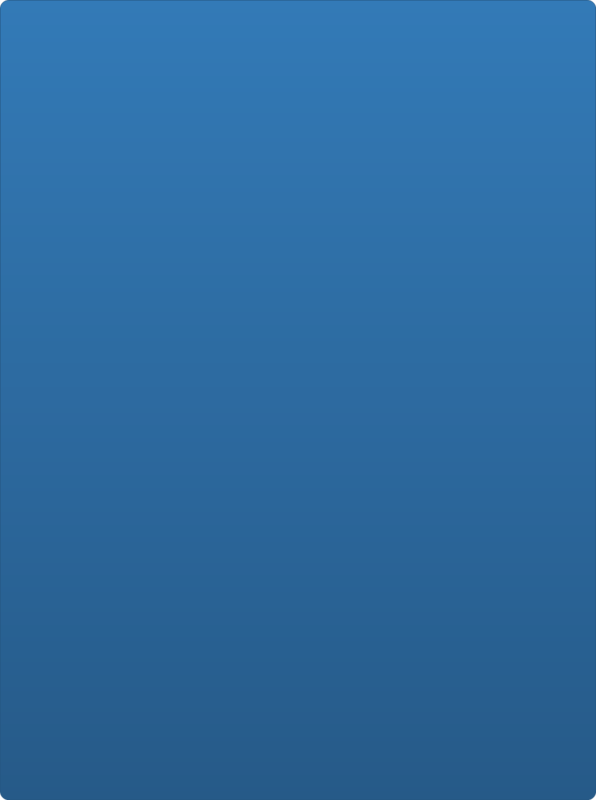 These contacts may give direction to another law enforcement agency, depending upon jurisdiction. This classic phrase applies; "ignorance is no excuse". 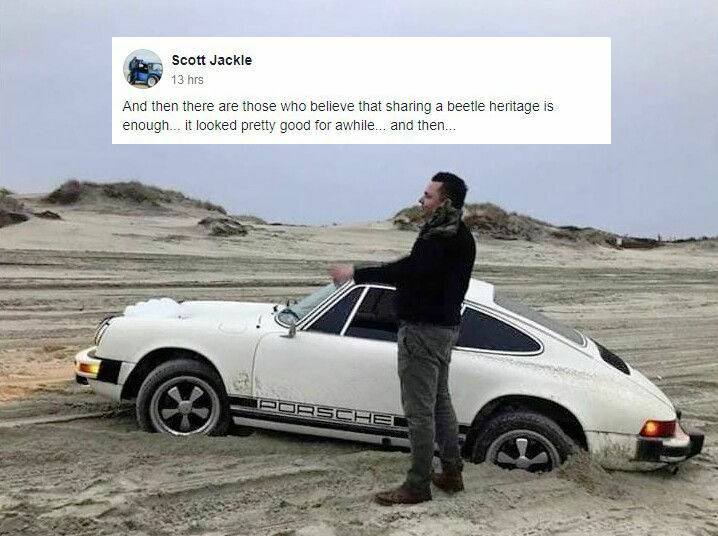 that also shares a "beetle heritage"? Although not an absolute guarantee to prevent head-on or rear-end collisions (or contact with unseen pedestrians); buggy whips/flags (usually 8 - 10 feet high, when measured from the ground surface upwards) are currently required in the areas listed above, and are highly recommended in any situation where off-road/moving vehicles may pop up from out-of-sight in a moment’s notice. Here is one of the main problems with this extremely closed-minded (DBOBX) group. Although they claim to use a “spotter or radio communication” on their little group excursions, they fail to grasp the concept that other dune buggy enthusiasts may attempt to mimic what they see in the (DBOBX) videos/photos, even if they themselves decide to venture out on their own (or without radio communication, or without a spotter…..) Vince Simansky and Scott Jackle both appear to be under the misguided impression that they are the local and exclusive “let’s-go-behind-the-OBX-dunes” Pied Pipers, and everyone else that has the desire to venture behind these same dunes will contact them in advance for an appointment. How short-sighted is that? Would you yourself consider their complete and public disregard at the buggy whip/flag suggestion as “leading by example”? 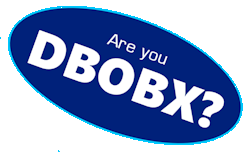 As (DBOBX member?) Charlie Licciardi himself recently stated; “People forget that the beach IS the road there, and road rules still apply in addition to sand safety and common sense. We've always driven accordingly and never had a problem.” Yes Charlie, and those roads are not intended to be used as narrow playgrounds to be driven in a reckless and/or irresponsible manner. Common sense, past experience and current laws established by the BLM (Bureau of Land Management) dictate that buggy whips with flags are prudent and necessary requirements. We aren’t talking dune-jumping “Rat Patrol” here, but basic, responsible, off-road driving. Think about it this way, Charlie; its “sand safety and common sense” (your words). 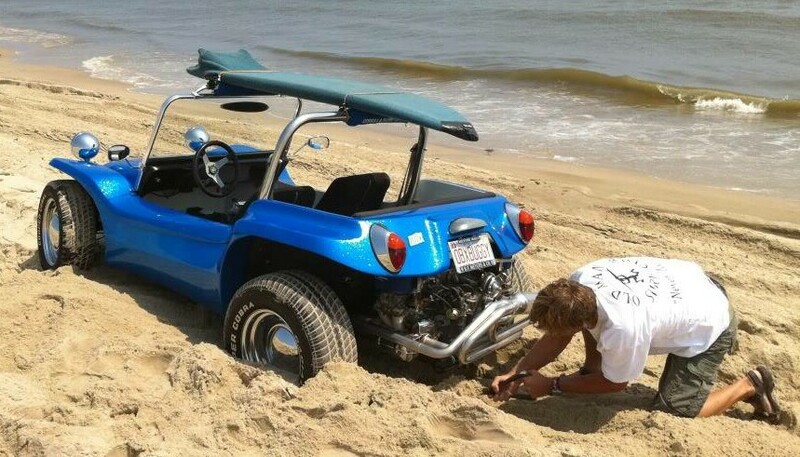 Although buggy whips and flags are not currently required on off-road vehicles that venture over and behind the dunes at the Outer Banks, the overall nature of most fiberglass dune buggies themselves (rear engine, 2-wheel drive) inherently make them more vulnerable that the average 4-wheel drive vehicle. In order to make sure that the typical 2-wheel dune buggy can make it over the crest of the average OBX dune/roadway (and to avoid getting stuck or bogged down in the process), the driver may need to build up a fair amount of speed before doing so. This tendency can be seen in several of the DBOBX Facebook group’s posted videos. Two examples can be seen here; are these drivers prepared to immediately stop if a situation arises?